Not exactly a tool but useful in the shop or office when you need to keep referring to a book that won't lie open on its own. 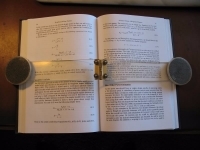 The book-holder-opener is made of two pieces of transparent plastic (so you can read through it) hinged in the center (so they can conform to the book profile) and fitted with weights (Petri dishes filled with bird shot in my version) to hold even the springiest book open. Last edited by mklotz; 07-08-2017 at 09:05 AM. Those plexiglass panes are pretty clever, Marv. Thanks for posting this.